Jorgo Riss is director of Greenpeace’s European unit. From Wall Street to the City of London, the proponents of unbridled market power breathed a collective sigh of relief on Thursday, as the EU looked set to revive a controversial agreement on trade and investor rights with Canada. The Belgian region of Wallonia – and the rest of Belgium’s 4.5 million French-speakers – threatened to derail the deal, but a last-minute agreement in Belgium paved the way for approval by the EU’s 27 other governments and Canada. Wallonia dangled EU credibility by a thread, warned the European Commission and politicians across Europe. Much of the media, particularly the financial press, has dutifully echoed this line, pouring scorn on the Walloons, painting them as loony outliers. But, after extensive parliamentary scrutiny, Wallonia’s “non” may even be emerging as source of pride for millions of people across Europe. Could CETA’s rejection instead bolster EU credibility and help bridge the gap between the EU and European citizens? CETA champions were anxious to portray Wallonia as an island of dissent among a sea of support. They reduce the debate on trade deals to irrelevant chauvinistic choices. They rarely address specific concerns, instead finding it easier to point to a supposed rise in protectionism. The reality outside the boardrooms and corridors of power is rather different. Wallonia wasn’t alone, thousands of regions, cities and districts across Europe have objected to CETA and other similar ‘trade’ deals threatening to give multinationals exclusive rights. Millions of citizens have signed petitions and taken to the streets. Among them workers, farmers, consumer organisations, doctors and teachers. They have called for the protection of public services, health, the environment, and social and labour rights from the dangers of international treaties that give investors privileged powers and constrain democratic decisions in the name of ‘trade’. The countries and parliaments which, like Wallonia, have already made the effort to debate CETA in detail have raised several concerns, from the lack of social and environmental standards, to the unacceptable special rights for foreign investors. While many commentators now recognise that EU trade policy needs a revamp, CETA supporters bemoan the decision to give sovereign parliaments a say. And their solution is not to hear public concerns, but to reduce the scrutiny of deals like CETA. EU credibility is dependent on the approval of CETA, they argue. But if they were honestly concerned about the future of European cooperation, it would become evident that, if anything, the opposite is true. EU credibility depends not on the adoption of CETA, but on fulfilling the commitments to the peoples of Europe laid out in the Treaty on the European Union. Principles of democracy, the rule of law, the promotion of economic and social progress, sustainable development, and environmental protection are all key to EU credibility. Promoting them should be the EU’s duty and is probably also the best antidote to Euroscepticism, populism and extremism. As the treaty says, economic and social progress should go hand in hand, and can’t be separated from environmental protection. The success of EU trade policy will depend on transparent negotiations and a genuine involvement of civil society, with a clear goal to promote the public interest. Trade agreements should be an opportunity to shape progressive global standards, not a chance to strip away public protection and the hard-won rights that underpin Europe’s prosperity. The EU must stop CETA because it threatens the rule of law by allowing multinationals to sue governments over measures that protect people and the environment, but may impede trade. The writing is on the wall. Canada already ranks fifth in the world for number of companies suing foreign states through trade deals. It has challenged the EU’s regulation on toxic chemicals, REACH, at the World Trade Organisation 21 times. Canadian companies and the Canadian government have also challenged European bans on asbestos (unsuccessfully), hormone treated beef (successfully) and GMOs (successfully), and have successfully lobbied the EU to stop the phase-out of polluting fuels like Canadian tar sands. Canadian citizens are the first victims of this behaviour. Rejecting CETA would help protect them and Europeans against the corporate capture of our democracies. It would be a rejection of the kind of politics that carves out special rights for tax-dodging corporations, instead of serving the wider interests of society. 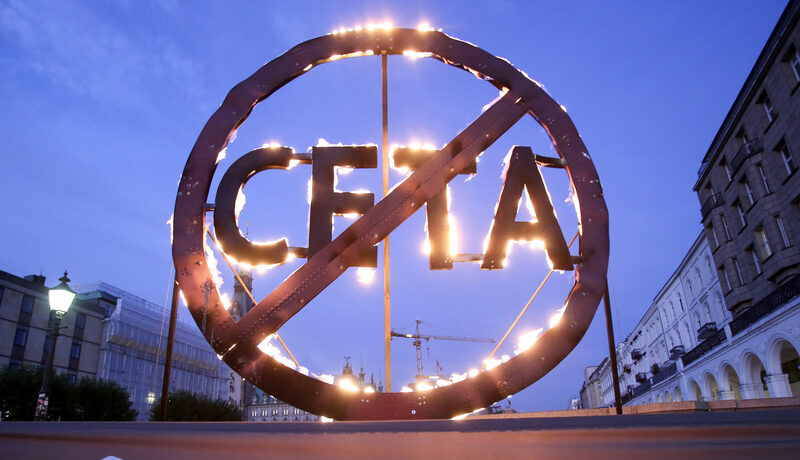 Stopping CETA will not stop trade nor undermine the EU’s credibility with its citizens, who count on the EU to uphold and advance the fundamental values of security, peace and prosperity. Instead, stopping CETA will stimulate a rethink and revitalise global trade efforts. Trade deals have a potential for good. But to get there, our governments must first recognise that trade is a tool to increase long-term prosperity in a healthy environment. A means to an end, not an end in itself. CETA is bad for the European Union as we already know the idea of big business being able to over-ride the will of the people is in the words. Other member states agree also. This is just a ruse to allow the hated TTIP in to the EU by the back door.